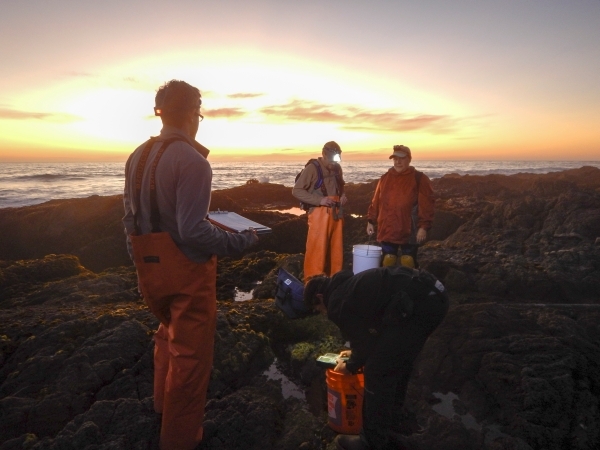 Last week was the kickoff a new project looking at diversity and productivity effects of nutrient and temperature alterations in high intertidal pools. This work is being done in collaboration with Matt Bracken’s Marine Biodiversity Lab group at UC Irvine. Pictured below are Dylan Projansky from SJSU, Matt Bracken (center), Genevieve Bernatchez (UCI), and Samuel Bedgood (UCI, bending over reading the YSI DO sensor). Evening sampling in the high intertidal zone.